a noninvasive treatment known as high-intensity focused ultrasound, or HIFU, is changing the way doctors treat prostate cancer. With HIFU, doctors can eliminate prostate cancer without causing long- lasting side effects, such as problems with urinary continence or sexual dysfunction. One of those doctors, Stanley Myers, MD, of Northwest Urology, has partnered with a company called HIFU Prostate Services to offer their patients this cutting-edge, noninvasive treatment and help men maintain their quality of life after prostate cancer. What is HIFU for Prostate Cancer? HIFU is a one-time, non-invasive, outpatient procedure that uses ultrasound energy to heat and destroy tissue in the prostate. It is radiation- free and bloodless and studies show that the risk of side effects, such as erectile dysfunction and urinary incontinence, are significantly lower with HIFU than with surgery (radical prostatectomy) or radiation. 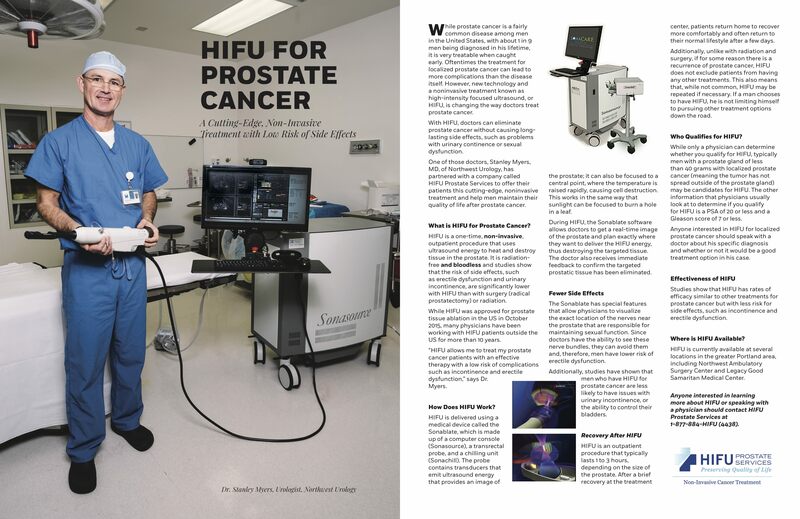 While HIFU was approved for prostate tissue ablation in the US in October 2015, many physicians have been working with HIFU patients outside the US for more than 10 years. “HIFU allows me to treat my prostate cancer patients with an effective therapy with a low risk of complications such as incontinence and erectile dysfunction,” says Dr. Myers. HIFU is delivered using a medical device called the Sonablate, which is made up of a computer console (Sonasource), a transrectal probe, and a chilling unit (Sonachill). The probe contains transducers that emit ultrasound energy that provides an image of the prostate; it can also be focused to a central point, where the temperature is raised rapidly, causing cell destruction. This works in the same way that sunlight can be focused to burn a hole in a leaf. During HIFU, the Sonablate software allows doctors to get a real-time image of the prostate and plan exactly where they want to deliver the HIFU energy, thus destroying the targeted tissue. The doctor also receives immediate feedback to confirm the targeted prostatic tissue has been eliminated. The Sonablate has special features that allow physicians to visualize the exact location of the nerves near the prostate that are responsible for maintaining sexual function. Since doctors have the ability to see these nerve bundles, they can avoid them and, therefore, men have lower risk of erectile dysfunction. Additionally, studies have shown that men who have HIFU for prostate cancer are less likely to have issues with urinary incontinence, or the ability to control their bladders. HIFU is an outpatient procedure that typically lasts 1 to 3 hours, depending on the size of the prostate. After a brief recovery at the treatment center, patients return home to recover more comfortably and often return to their normal lifestyle after a few days. Additionally, unlike with radiation and surgery, if for some reason there is a recurrence of prostate cancer, HIFU does not exclude patients from having any other treatments. This also means that, while not common, HIFU may be repeated if necessary. If a man chooses to have HIFU, he is not limiting himself to pursuing other treatment options down the road. than 40 grams with localized prostate cancer (meaning the tumor has not spread outside of the prostate gland) may be candidates for HIFU. The other information that physicians usually look at to determine if you qualify for HIFU is a PSA of 20 or less and a Gleason score of 7 or less. Anyone interested in HIFU for localized prostate cancer should speak with a doctor about his specific diagnosis and whether or not it would be a good treatment option in his case. Studies show that HIFU has rates of efficacy similar to other treatments for prostate cancer but with less risk for side effects, such as incontinence and erectile dysfunction. HIFU is currently available at several locations in the greater Portland area, including Northwest Ambulatory Surgery Center and Legacy Good Samaritan Medical Center.